When you perform a search on Google, the results are displayed in a list and you have the option to click through pages of the results. 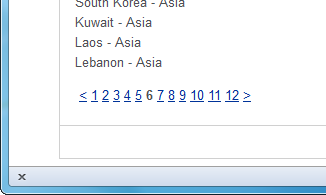 That is an example of pagination. Pagination simply means the user has the ability to click through the pages of results, viewing a subset of them each time, rather than having to scroll down the screen for ages. Pagination is particularly useful when you are coding an application that interfaces with a database. A large dataset might have hundreds of possible results for one query, and pagination creates a much nicer user experience. In this tutorial, I’ll use CodeIgniter’s pagination library to show you how you can create a paginated list of results from a MySQL database. Along the way, you’ll also see how to fix a problem with the pagination links that the library might produce. I’ll assume you have an installation of CodeIgniter 2.1 ready to go. For the database, I’ll use the official sample database provided by MySQL that available for download as an SQL file. CodeIgniter’s database class with Active Record is used to count and retrieve the data from the database. The record_count() method returns the number of records and is needed because one of the options in the $config array for the pagination library is $config["total_rows"]. The library will use this along with other options we set to work out how to divide the results up into pages. 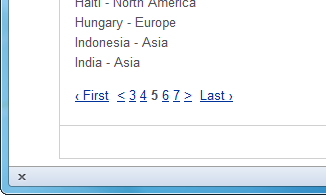 The fetch_countries() method retrieves a list of all the records from the Country table. There are two arguments for this method: $limit and $start. They will be passed into the query to determine how many records to return, and what record to start from. The arguments will be set in the controller. Next, we need to create a method in the default Welcome controller (controllers/welcome.php) called example1(). But just before we do that, we’ll need to load the model and also the pagination library in the class’ constructor. The example1() method starts by providing some of the most common configuration options for the pagination library. The options are placed in an array which is then passed as an argument to the library’s initialize method. The library requires the options must pass a base URL, a total row count, how many rows per page we want, and which part of the URL will contain the page section the user is using. 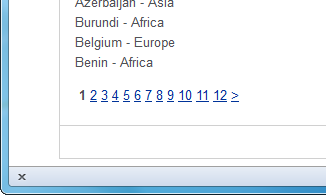 Remember those parameters that were set required by the query for a list of countries ($limit and $start)? Those are set next in the call to the model’s fetch_countries() method. The $page variable uses the ternary operator to either set its value to whatever is in the third segment of the URI string or to zero (meaning the user is on the first page). Finally, the create_links() method of the pagination library creates the pagination links and then we load the view to display the outcome. Click the pagination links and you should find yourself moving through the 239 records in the Country table. But you may notice that the number of linked digits change. Initially there were there digits, and later there five! There is a config item that might help to solve this problem. It’s probably useful at this stage to remember that we are retrieving records from a database and CodeIgniter has to re-calculate the digit links as each page is accessed. The first thing we can do is to disable the first/last previous/next links to tidy up the navigation. It doesn’t stop the expanding digits, but it does tidy things up. The second thing we can do is calculate how many pages there are by dividing the total rows by the number of rows required per page, round the result, and pass it to the $config["num_links"] parameter. This will improve the links now. Now you know how to use the most useful configuration options for the CodeIgniter pagination library, and you can also fix the way the pagination links are displayed to provide a consistent experience for your users. A user guide comes with every download of CodeIgniter, so be sure to check the other configuration options for the library there. It contains options for styling the pagination links, and changing the way the links are rendered on the page. Comments on this article are closed. Have a question about PHP frameworks? Why not ask it on our forums?